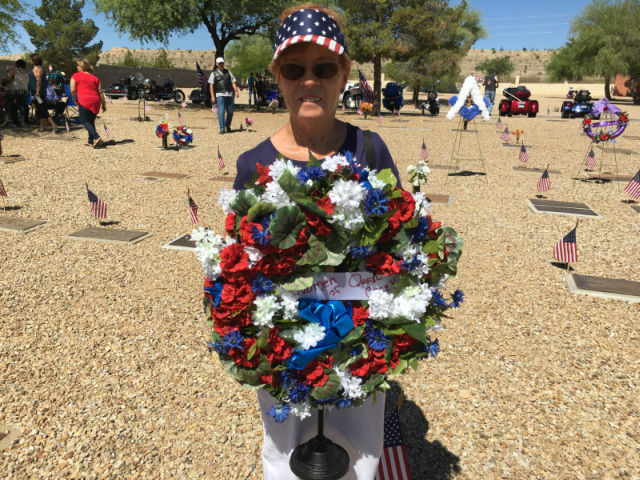 Peggy McGee presents TWOQC wreath on Memorial Day. Thanks to those who came to the Green Valley cemetery to pay tribute to our Nation’s veterans on Memorial Day. And, thanks to those who remembered them with a moment of silence at home too. 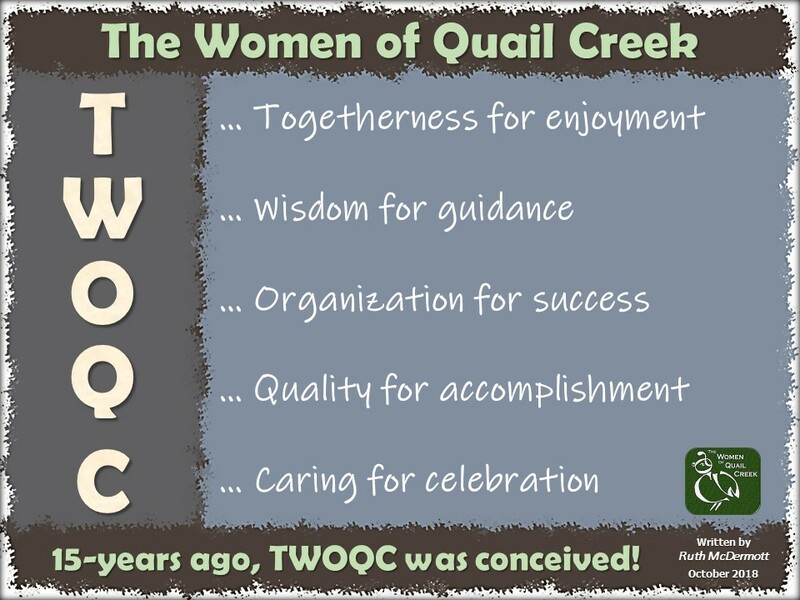 TWOQC was the only Quail Creek organization that presented a wreath this year. We are one patriotic group! Peggy McGee presented this year’s wreath that was made by Sandi Beach. Check out the fly-over of the F-16s from the 162nd Fighter Wing: (Memorial Day video clip). This is the command that gets all our coupons and for whom we sponsor the baby shower. Nancy Wilson will be selling tickets for the June luncheon in the lobby of the Madera Clubhouse on Monday, June 13 from 11:00 a.m. to noon. “A Russian Adventure” will feature a performance from the Arizona Balalaika Quartet under the direction of Mia Bulgarin Gay. Tickets are $20 each and are non-refundable. The bar opens at 11:30 and luncheon will begin at 12:30. Make your plans and have a printed list of all ladies you are buying tickets for – only ten seats at a table please! This will make it so much easier for Nancy. Please welcome our newest arrivals: Miss Madelyn Elizabeth Roe, and Miss Ellie Alegria. Fifteen of the 29 babies have arrived for us to cuddle at the baby shower. We are expecting 2 (maybe 3) more by June 25. Our next meeting (our next to last!) is Monday, June 13 at 11:00 am in the Kino Conference Center. Any donations can be accepted at the Madera Clubhouse or at the Rodgers Home (2640 E Sawyer Road). Please contact Pam Rodgers at 520-561-7969 or prodgersaz@gmail.com. 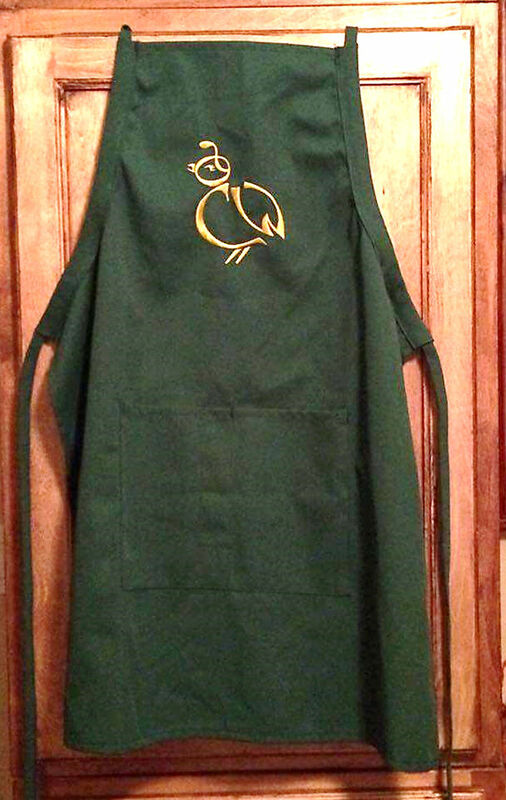 Aprons will be on sale in the Madera lobby on Monday, June 13 from 11-noon. They will make great Father’s Day gifts and will be helping homeless teens remain in school. If you can’t get there on the 13th please contact Peggy at pjmcgee@cox.net and she will make arrangements for pick-up. Aprons are $18 each or 2 for $35. All proceeds will go to students in the Sahuarita and Walden Grove high schools. Coupons for the National Guard should expire July 18 or later. Coupons may be turned in at the June 27 luncheon or dropped off at Judy Poffenbarger’s (2390 E Bluejay Bluff Lane) or Peggy Richmond’s (2731 E. Eba Court) at any time. ♥ July 25 – 6:30 p.m. – Passionate for Coffee. Roasting Beans for the Perfect Cup of Coffee presented by Anna Perreira, Yellow Brick Coffee.